What debt crisis? The 2013 rally should keep going. 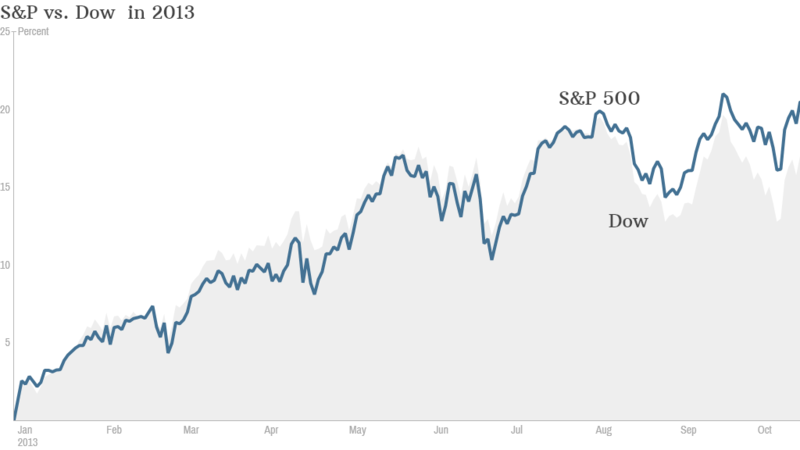 Both the S&P and Dow have been on a tear in 2013. Question: If the markets didn't flinch when confronted with the possibility of the United States government defaulting on its debt, what could cause a major sell-off? "The amazing part of this whole situation was that investors were not going to let this rally go away," said Quincy Krosby, market strategist at Prudential Financial. She noted that few investors were willing to take big bets against the market through short positions (i.e. investments that pay off when stocks fall) during the past month. The Dow gained more than 1% since the government shutdown kicked off on October 1st. The index is now up 17% for the year and is hovering around its all-time highs. The broader S&P 500 is up nearly 21% in 2013 and is just a few points below last month's record high. Wednesday night's debt deal will only give the U.S. a temporary reprieve from the drama that has consumed Washington for the past several weeks. Still, analysts think investors will be happy to continue ignoring Washington for the next few months. Krosby said the market now has two rallying cries for the rest of the year: Don't fight the Fed. Don't fight the fourth quarter. Stocks have rallied since the Federal Reserve announced it would not cut back, or taper, its bond buying program. And few expect the Fed to taper before the end of the year because of the uncertainty created by the government shutdown and flirtation with a bond default. As for the fourth quarter, Krosby said it's typically one of the best times for stocks during any year. The market often rallies in November and December. This year, she expects stocks to do even better simply because hedge funds and mutual funds that have trailed the market will be forced to put money to work to catch up to the broader indexes. Bruce McCain, chief investment strategist at Key Private Bank, also thinks stock will keep climbing. He doesn't believe they will continue to rise as quickly as they have for most of 2013. But he believes investors have already forgotten the debt scare. "There's not a lot out there that seems likely to disrupt positive sentiment," McCain said.